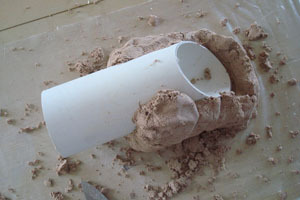 Holey Roket can be made using a pipe for making briquettes as a mold for the combustion chamber. Clay is mixed with sawdust, vermiculite or other material that provides insulation. Sawdust burns when the stove is fired in a kiln, which makes tiny air-bubbles providing important insulation (to keep the fire as hot as possible). Please note: you can use less sawdust for more durability – longer lasting stove, but the insulation property decreases – less efficient heat transfer). 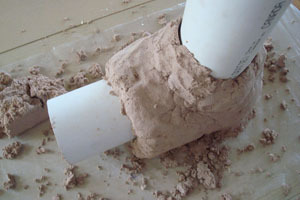 The mixture also varies according to available clay and sawdust (if particles are small, use less sawdust). Consider talking to the local pottery-maker, since they have experiences with local clays. The mixture is applied around the plastic pipes with approximately 1 inch thick layer all around the pipes. Thicker walls will make the stove more durable, but will take longer for the mass to heat up, which can cause smoke before the stove heats up. 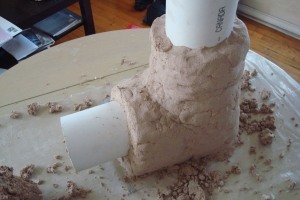 Make sure the clay is applied with no bigger air gaps as the stove may crack during firing. 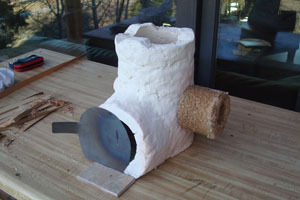 Briquette holders can be added to pre-dry briquettes at sides of the stove and hold the stove easier while hot. There could be 2 – 3 holders around the combustion chamber mounted approximately in the middle of the stove’s height. 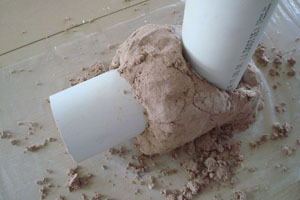 Make sure you make a a proper clay ‘glue’ when mounting them; they could fall off if not glued well. The pipes are then pulled out of the stove while its still wet. Be careful not to damage the round form on the bottom of the stove so briquettes can perfectly fit. If your clay shrinks a lot and you’re using the same pipes for making briquettes, you can add a layer of 5mm cart-board around the pipes to make sure briquettes will fit in the feed. After about a week or two of drying the stove (first in the shade so clay doesn’t crack) the stove is fired in a kiln. You know when a stove body is fully dry when it is not cold on a touch. A metal casing could be made around the stove body to or the liner could simply be surrounded with mud or other material at hand. There is a referential video that explains the making process more in-depth. Please contact Rok for more additional info!